Given the recent lending changes in Australia renovation is a great option for investors with an existing portfolio who are unable to buy new properties. There was recently some major changes to lending here in Australia specifically for investors. Basically, it makes it harder for you, as an investor, to grow your portfolio as fast as you could. But one of the options you still have is to actually renovate a property in your existing portfolio to get both equity growth and to get cash flow growth as well. Today, I’m actually going to sit down with Jane Slack-Smith from The Ultimate Guide to Renovation to talk about what you can do to look at your existing portfolio and how you can generate a profit from it through renovation. At the end of this interview, we talk about her free video series where she goes through some renovations that she has done. I do recommend that you check out that video series and go through my affiliate link at onproperty.com.au/reno, R-E-N-O in order to get access to that and you’ll also get a free checklist of something that you can fill out and go through when you’re inspecting a property; so that’s super valuable. Go to onproperty.com.au/reno to check that out and here’s the interview with Jane Slack-Smith. Ryan: Hey guys, Ryan here from onproperty.com.au, helping you find positive cash flow properties. As you guys may know, there’s been some big lending changes that has happened here in Australia of recent, which can make it harder for people to expand their portfolio. I got an email from Jane Slack-Smith, who’s my renovation expert, the other day saying that renovation can be an option for people who want to continue growing their portfolio during this time when these lending changes have made it more difficult for investors. 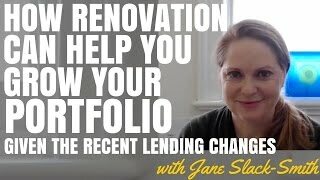 So I thought I would get Jane on today to talk about this, to talk about renovation and how that can fit in, given the current landscape of the lending market in Australia. Hey Jane, thanks for coming on. Jane: Hey Ryan, thanks for having me. Ryan: I think a lot of people might not necessarily know this but you’re renovation but you’re also a mortgage broker as well. So you’ve really got both sides of the coin here. Ryan: So let’s just do a brief overview for people who don’t know of what changes have occurred and how that affects investors. Jane: Well, if I kind of look back in a little bit of history, around December 2014. APRA essentially said, “Look, we’re a little uncomfortable with the growth of the investor market that the banks have and we think that the market’s getting a little bit out of control in the sense that the Sydney and Melbourne market were going gangbusters – and still are to some extent.” APRA and the Reserve Bank of Australia and ASIC usually operate separately. Now, if we look at RBA. The RBA, their reserve bank can put rates up or put rates down to try to control the amount of money in the economy and property prices. But as you can guess, it’s really unfair for all of Australia to have the interest rates go up with just the Sydney and Melbourne market going off. I don’t really [inaudible 2:54]. It’s an Australian based decision, the RBA. See, RBA really had the decision taken out of their hands. They started – I going to use the word “colluding” – with APRA and ASIC. They’ve kind of started working together and over the last 6 months, that’s what we’ve seen. Ryan: June 2014 or 15? Jane: 15. So just in the last couple of months, they’ve essentially said, “You have to make some changes here. We do not want the growth of your mortgage book to be over 10% to investors.” Now, they’ve set guidelines; now this is really different from what happened in New Zealand. In New Zealand, they actually set an absolute ruling so they started changing specifics. So, in Auckland, loan-to-value ratios didn’t go over 70%. So, they didn’t make those specific changes, they kind of just gave some guidelines. So, the number 1 thing that APRA has done is, APRA has actually changed; (a) they have told the banks that they have to restrict the amount of growth in investor lending but (2) they’ve also told the big 4 banks plus McQuarry bank, they have to increase the amount of capital that they have. So, they have to hold more capital as well. This has made some quite significant changes. At the same time, the ASIC, who is kind of like a consumer monitoring division of the government, for a want of another word, basically came back and said, “Look, we want to make sure that the consumers are looked after as well. And as part of responsible lending, it’s not [inaudible 4:53] actually look at just the interest or repayments that that bank is going to take on. They want us to also have a look at what other debts the actual person has and buffer those as well. Ryan: I went through this with a guy called Ben Everingham over at my site. If people want to go into more detail and the exact things that, I guess, have been suggested that the banks do, just go to onproperty.com.au/301. But basically, from my understanding, what it means is that for investors, if they want to expand their portfolio, if they’ve got an existing portfolio already, it’s very difficult for them to expand. Or if they have a small portfolio, for them to grow it quickly is going to be very difficult, if not impossible. Given the current scope of things and the fact that people who have existing portfolios may not be able to borrow again and buy another property at the moment, what can they do and how can renovation fit into their strategy to help them grow the equity to grow their cash flow but then also to ultimately grow their portfolio? Jane: It’s a great question, Ryan. I think the thing is, there’s two parts of this. One is the new investor looking to invest without a portfolio and the current investor who has a portfolio. For instance, I have a very large portfolio, I’ve looked at my existing portfolio and used my revamp renovation strategy on one of those small properties in the last 6 weeks. So, as an example, had the property valued 6 weeks ago. I had it valued again yesterday, there’s $100,000 differential in that valuation and I just spent $33,000 on renovating the property. So, about 5% of the value for the property was spent. Normally, a cosmetic renovation’s about 10% but it’s a smaller property, so 5%. I spent $33,000, the property’s gone up by $100,000 and that 6-week period. So, capital growth hasn’t had a lot to play in there nor has buying below the market; which are the 2 other prongs of my 3-pronged trident strategy of how to make money when you’re buying a property. So, looking at my current portfolio, I’ve been able to actually grow that equity in the property. Now, from a borrowing capacity point-of-view, I may not necessarily be able to access that but the rent has gone from $570 a week to $670 a week. So, there’s a significant difference in the rent as well. I’m getting an extra $100, improves the cash flow. I have equity there; when things settle down, we’re able to access that equity. So for current people with current portfolios, looking at their current portfolio and looking at that revamp of what they can do, there’s really some dollars in there. Ryan: What do you think the value is for people in doing a revamp strategy in taking a property that they own existingly and doing a renovation on that property? Obviously, you’ve got that extra growth that you may or may not be able to access. In terms of a longer term strategy and, I guess, people who are trying to achieve financial freedom, how does that play into that and help people? Jane: Look, I think the important thing is, one of the things when I talk to either my mortgage broking clients or my students [inaudible 8:36] I talk about what their goal is and the timeframe to achieve the goal. Because in actual fact, as you know, Ryan, we’ve talked about many times, property is just the vehicle to get you to where you want to go. So, although we all love property and we love buying property and selling property and renovating property and talking about property, buying books and going to seminars, the reality is, it is a vehicle to achieve what we want to achieve and for everyone, that’s different. So it’s important about working out what your goals are. So your goal might be you want a $50,000 passive income in 15 years’ time. That could be the fact that you want to only work 3 days a week or you want to start your own business and create income elsewhere. So, it’s about understanding your goals. Once you understand the goal and the timeframe, you can then work out what your property investing strategy is, your buying criteria and you can actually then work out specifically what kind of property you need to buy. What that means, in terms of renovation, is that if you’ve actually got a property or you can actually buy a property and have the ability to renovate that property, you can actually manufacture the equity or the growth of your portfolio so you can get to your goal sooner or you can get to in the timeframe that you’ve set, a bigger goal. You can achieve something more. So, renovation is really an opportunity. If you do a strategic renovation, is an active property investing strategy that allows you to improve your cash flow but also to create the equity so you can get to your goal sooner. Ryan: I guess a lot of people, when they look at trying to achieve financial freedom through property or whatever goal they have, they definitely look at expanding my portfolio as probably the main driver of that. So going 10 properties in 10 years or whatever it is people teach. People want to continue to add properties on in order to get to the goal; in order to get capital growth; to hopefully get positive cash flow; to get rental growth as well. But then, I guess, given the current lending environment for people who have existing portfolios, they may not be able to get any growth by expanding their portfolio because of the lending situation. So, by actually taking the focus and putting it in your existing portfolio, you can still continue to get growth over this period of time. Growth in both equity and in cash flow to move you closer to financial freedom. And then, I guess, when lending does ease up in the future; if it does, then you’d be in a much better position and if it doesn’t, you’ve manufactured that extra growth. You’re getting that extra cash flow for however many years it takes. Is that the idea? Jane: Exactly. You got it! That’s it! It sounds so simple when you say it. Ryan: So, if someone has an existing portfolio, what sort of things should they do to look at their portfolio? Say I’ve got 5 properties or 4 or whatever, how do I know which property to renovate and how do I know what kind of renovation to do? Jane: Perfect question. Actually, one of my students from The Ultimate Guide to Renovation last year was a really experienced guy, had renovated 11 properties and when I kind of forced him to go back through the course – because the first part of the course, 6 modules of the course is locating the right property and the last 6 modules is about cosmetic and structure renovations for flipping or holding. I forced him to go back through his current portfolio and the properties that he had bought previously to see of he bought the right properties in the right area and actually made money. He found out maybe 4 or 5 of those didn’t actually create the equity that he thought that he had in the renovation. At that time of doing the course, he was actually actively pulling out kitchen to put a new kitchen in and we showed him how maybe just painting the benchtops and changing out some of the handles and painting the doors, etcetera, could create a whole new look. We saved him $8,000 straight up. The thing is, in your current portfolio, I would be renovating a property if it wasn’t the right property in the right location to start with. A lot of people get this wrong. In actual fact, I spoke to a guy yesterday. Last 2 years, a median income, he’s bought 7 properties – low price properties. But he said, “I think they’re duds, I don’t think there’s any growth in them. I don’t know what to do.” The key to making any money on real estate – be it using renovation or anything – is understand that there’s some growth potential. Because we all want cash flow, we definitely want cash flow. But we also need growth to get our portfolio from the future. So, from my point of view, if I had 4 or 5 properties, I’d be looking at the property that actually fits the demographic. So, I’d be going up to census.com.au, I’d be putting in my suburb in the market stats quick analyser and finding out what the typical person wants in that area. So, the typical person is a family with 2 kids that drives to work and I’ve got a 1-bedroom unit, that’s not where I’d be spending my money. I’d be looking at a property that fits the demographic. I’d then be going and looking at that suburb to make sure that there’s some growth as well. Ryan: Going back to demographics, the reason that you want to choose the property that you have that has the largest demographic reach, I guess you would call it, the most people in the area that want to live in that type of property. Is the reason that you choose that demographic is because you have a wider audience or wider customer base that you could rent or sell that property to? Whereas, let’s say I’ve invested in a rural area and I’ve got a studio unit and at 0.1% of people in the are live in studio units. If I renovate that and increase it, there’s such a small pool of people looking at renting or living in those properties that I’m not going to get the growth. But if I have a 3-bedroom house in a rural area and 40% of the population lives in a 3-bedroom or whatever. Are you saying, because there’s a larger pool of people, that’s why we’ve got a larger chance of growth and we’d focus on that? Jane: Yeah. For me, I’m such a low risk investor. I want to have a kind of exit strategy and an emergency exit strategy. So, if I need to get out of a property quickly, I need to know that the majority of the market wants to be able to buy that property. So, I don’t want the best property in the street and I don’t want the worst property in the street. What I want is the typical property that typical market will want to rent and to buy. So for me, it’s very much about understand that, what drives growth is that the majority of the market wants that type of property. So, for me to provide the typical property allows me to be assured that there’s going to be someone who wants that property. Therefore, the growth characteristics, just to align to the type of property fits the market is ticked and then we want to make sure that we have, obviously, infrastructure and population growth and all those other good things as well that drive growth. Ryan: Okay. We’ve previously talked about, in other interviews that we’ve done, how to choose a property to renovate. Like looking at the area and making sure there’s disparity between renovated properties and un-renovated properties and things like that. Do you go through a similar process when assessing your existing portfolio to say which one should I renovate or is it slightly different? Jane: Yeah. No, it’s exactly the same. I mean, as I said, there’s no point renovating a property in the wrong area and you run the risk of actually overcapitalising and not getting return for what you want. So, for instance, if you could spend too much in creating the perfect renovation, it doesn’t mean that you’re actually going to get the value from it. So you have to be able to look at – if I had 4 or 5 properties and I also going to say, “Which one am I going to spend my money on to do the renovation?” (a) As I said, I’d be looking at making sure that property fitted the majority of what the market wants and then I want to find out, what does the majority of the market want? So, just going through – free, obviously, just spend some time going through what other 3-bedroom properties look like. [inaudible 16:54] Then you can work out what the standard of fixtures and fittings you need to incorporate in your renovation as well. Ryan: Yup. So if you’re in an area and they don’t have those stone benchtops that are really nice but they have security bars, and you don’t have stone benchtops and you don’t have security bars, well, it’s probably worth investing in security bars rather than spending thousands of dollars in the kitchen. Ryan: I guess, what you’re saying or what I’m hearing is that you look at the area and you look at what most people want and you look at your property and what does your property not have or what is your property missing that people in the area want? And then, work out how to incorporate that. Is that the best way to spend your money, do you think? Jane: Absolutely. If you look at one of the properties in your portfolio, and it is a 2-bedroom unit, and you do the work and find out that the major demographic wants a 2-bedroom house, and they want to have a car port and you have no garages, then I wouldn’t be spending any time in renovating that first. If you had another property that actually fitted the demographic that was needed. Ryan: Okay. Now, let’s say we’ve found our property that we’re looking at renovating. Are we talking about just putting a lick of paint on this property, maybe some new carpet in or are we talking about a complete overhaul of this property? New kitchen, new bathroom, what are we talking about to get the best bang for our buck? Jane: Absolutely. That’s the secret to it; is not just to add a standard renovation for every property. You can gut any property and make it look beautiful but the reality is, we want to make money. So, for me, I made $3 for every $1 that I spent in my recent little refresh, revamp renovation. And that’s what you want to try to achieve, at least $2 for every $1 that you spend. So you want to look at, what does the market want? Once again – Domain, Real Estate – get on and see what the finishes and fixtures look like. Because if your kitchen is good enough, maybe you just need a lick of paint on the benchtop or maybe pantiles or re-enameled bathtub. For instance, in the renovation I just did; I did a whole new kitchen, it needed a new kitchen. But the bathroom, you know it’s a little bit tired, so we just cleaned it up, we painted it, we actually put a new toilet system in and put a new shower curtain in; that was it. You know, it’s what the market will require. Ryan: Yup. So, don’t go in and think that there’s just one way that you need to do it or you need to spend lots of money. You might have a property that just needs a lick of paint, a new carpet and the kitchen bathroom is fine for the area. But you might have a property that does need a new kitchen; so you really need to assess it. What about getting the funds to do the renovation? Your renovation cost you around $30,000, what if someone doesn’t have $30,000 in the bank? Can they go out and borrow that money given the current lending circumstances? Jane: Look, your borrowing capacity has reduced with the big banks and the majority of banks who actually are under APRA control. But I know 4 or 5 lenders that aren’t under APRA control. There’s still lender that are freely putting money out in the market and, obviously, they’re very busy at the moment but they’re not taking your existing debt at anything other than what your existing repayments are. So your borrowing capacity is the same. Sometimes it might involve refinancing to another lender that will give you the $30,000. But when we’re talking about $30,000, often some lenders and some of the bigger lenders, if it’s under a certain amount – under $20,000 for instance – it might just be a simple top-up that they’ll let go through if you’ve kept all your income – all your repayments on time. There will be a slight assessment but, often, for that smaller amount, you’re probably not going to see your borrowing capacity dip that much. But definitely the bigger lenders are more stringent and are acting quicker with these APRA and ASIC changes. Ryan: Yeah. So, I guess, people would need to see their mortgage broker. And definitely go to a mortgage broker rather than just going to one lender or your one bank because, as Jane said, it might be one of the big 4 who are quite strict on these changes. But if you go to a mortgage broker, you could get access to a variety of lenders who may be willing to lend you money to do a renovation or to even expand your portfolio. Ryan: I was just thinking, what about valuations? You said you got a valuation for your property before the renovation and after. Why did you get 2 valuations? Because, I’m guessing, you have to pay for valuations, don’t you? So why would go to that extra effort and expense? Ryan: Is that with most lenders, you can do that? You can get a re-valuation for free every year? Ryan: That’s cool. I didn’t know that. Jane: Basically, going back to your lender and saying, “Hey, I want to borrow more money from you. Will you front up for the valuation cost?” Of course, they’re going to go, “Oh, okay. Sure.” So, it gives you an opportunity to re-value your portfolio. Ryan: Can I just tell you that if someone wants to get their property re-valued and take advantage of the free valuation, do they go directly to their lender or should they go back to their mortgage broker to get that organised? Jane: It’s a good question. Obviously, I’m a mortgage broker, I’m going to say go to your mortgage broker but I’m going to tell you why to do that. Because there are risks involved. I can’t really have a client, that has a property that’s in one of the mining towns, it’s dropped in value by $300,000. His loan is very close to the loan-to-value ratio that the lenders are working it. So we don’t want to re-trigger valuations. So if people have their properties cross-collateralised without [inaudible 22:52] or potentially their borrowing capacity is so much less and a re-valuation could have the lenders saying, “Hey, how about we do a quick re-assessment and see if you can get the money at the same time?” It might be easy to tick the box and say yes. But really, you want someone looking over you, making sure that you’re making the right decision and those kind of requests aren’t triggering anything that could jeopardise your current loan. So, if you’re making your repayments on time, you’re making your repayments with ease, these lending changes obviously – I really believe the lending changes are going to give us a more stable banking system in the future. The biggest issue that is why this has happened is because APRA and the RBA and ASIC see that if everyone goes out and borrows this money now – interest rates are low, everyone’s getting like 4.5%. Once interest rates go up to the average of 7.5%, which could happen in 5 years’ time. Which coincides with the [inaudible 23:53] so we’ve got interest rates that are 3% higher plus everyone goes to principal and interest repayments. All of a sudden, there’s going to be a mass of people who can’t afford to keep their investment property. So they’re going to sell it. We do not want, in 5 years’ time, all these investors selling their properties. So, you know, this is kind of safeguarding us against that. So, there are reasons they’re doing that. But bringing that back to now, I’d be talking to my mortgage broker because we’re getting daily posi changes from banks. Honestly, we’re getting 2-3 a day in the last 6 weeks. If you’re not a mortgage broker doing this daily, and not access to that, you have no concept of what’s going on. So I’d go back to my mortgage broker who’s on to these daily updates and asking the question. The other thing is, the broker has access to a lot of lenders. So they could go to another lender and say, “I’m thinking of refinancing this property for this client, can I have an upfront free valuation?” And they could organise that for you. You obviously can’t go and ask for it if you’re not a client of the bank. There’s some opportunity also to go to other lenders and actually get those valuations done. Ryan: Okay, cool. So would you recommend that, for the normal person who doesn’t have a renovation cost that they want to do a case study for, would they get a valuation done before they start their renovation or would they just wait until after? Jane: After. Definitely after. I tell you what I would recommend, though, is that if they have a depreciation schedule and they speak to the quantity surveyor. Because I’ve just gone back and had my quantity surveyor go through the property and I’ve told them everything that I’ve done. And so, within the year that I get rid of the old oven and carpet, etcetera – the carpet for instance, had I think, it was an 8-year life to it and I only had it there for 5 years, in this year, I can immediately write off the other 3 years. So, getting a scrapping schedule done as part of your renovation is definitely going to make you money. Ryan: Yup. So if someone’s going to do a renovation, the scrapping schedule or the claiming the rest of the depreciation, do you get a quantity surveyor in before you do the renovation and let them know I’m chucking this out, I’m chucking that out or do you do it afterwards and just say here’s what I’ve done? Jane: Look, I would talk to them first and have them lined up and have them lined up, tell them what you’re doing. So I’ve just recently used a new depreciation schedule provider because they actually say that if you do a scrapping schedule and a small renovation, they’ll continue giving you an update to your schedule without cost for years to come; which I think is great. Capital claims is what they’re called. I think there’s opportunity for people to do it but do it afterwards. The quantity surveyor is not like a valuer. You’re giving them the costs of everything so they can depreciate it for you. So just keep photos of what it looked like beforehand and what’s being removed, what the renovation details are, then the cost of all the works that you’ve done and then get the schedule done. That’s that way I would do it. As for the question you had about valuations before the renovation, you want to make sure that you can make some money out of this. So we’ve talked about pricing disparity, and although you may not want to get a valuer, spend personally $500 and getting a valuer before and after the valuation but if you were going to do a valuation, you want to know what the estimate of the value of your property is. So if you’ve got 4 or 5 properties, to get an accurate estimate, you can do one of two things; you could buy a Residex Report on your property or RP Data or Australian Property Monitor report, they give you an indication of what your property’s worth; or get a real estate agent in. Because you want to make sure that you’re going to make money out of renovating the property. So you need to know what your goal is, your end goal for that valuation is going to be as well after the renovation’s done. So you don’t want a $500,000 property, you spending $20,000 on it and it’s then worth $520,000. You want a $500,000 property, $20,000 at least $540,000. That’s important and that helps you determine which property you’d renovate as well. Ryan: Okay. So you could get valuations done by real estate agents, which is probably going to be free because they’re just try and sell you and get you as a client, obviously. Jane: So you’d want a couple of agents, yes. Ryan: Yeah. You want to get that growth out of it. You want to get that equity growth and that’s such a good alternative for expanding your portfolio. If someone’s in the position where they’re saying, “Okay, I’ve got an existing portfolio. I can’t see a way that I can expand it at this point in time or I’m not ready to expand it.” Then, definitely, they should start thinking about renovations. Is there any other advise you would give to people looking at renovating their portfolio? Jane: My biggest advise is just make sure that you’re going to make a profit out of it. You can’t renovate a property that’s in the wrong area and hope to make a profit. And you can’t renovate a property to your own tastes and hope to make a profit as well. So understanding what your target market is, be they rental or for re-sale, is so imperative when you’re doing any assessment about renovating. Be it buy it or looking at your current property to revamp. Ryan: Okay. And you’ve got a free renovation guide or video series out at the moment. Let’s quickly talk through that and let people know about that. Jane: Sure. I’ve got a video series. Video 1 came out yesterday. I’m really proud of it, actually. And it actually is me walking through a property and looking at a property and you can download my checklist so you can use this straight away when you’re looking at properties and looking at your existing properties. But looking at a property and saying, “Where is the potential here?” So I give you some ideas of where the potential is. And then, fast forward, the video that’s coming out on Friday is actually going to be the property and we renovate it. We get in, a bit of elbow grease, and show you where to spend the time and effort. Video 3 that comes out next week is going to show you the before and afters and I’m going to give you an idea about my Box on The Back; which is a fantastic strategic structural renovation that you can perform to the properties that suit. And in video 4, we talk to you about The Ultimate Guide to Renovation course. So, video 1, 2, 3 gives you a bit of information, it gives you kind of a peek view of what you’re going to get in the course. As I said, it’s a 12-week online course, you have lifetime access. We got a huge amount of bonuses that we’re actually throwing in this year, which I’m really proud about. And then we get in and give you support with monthly group calls for the next year. We’ve got a incredible Facebook private page of people, they’re supporting each other. There are hundreds of people on there; some real amazing success stories. I’m so proud of it. We only offer it twice a year and, as you know, it’s fabulous. Ryan: Yeah. I’m always very happy to share it with people and I actually get emails back from my readers that say, “I really like Jane’s stuff. I really like her approach.” You’re really risk adverse, which I think people appreciate. You go through things – I guess, you use plain language and you go through things in detail, which people appreciate. If you guys want to check out that free video course, if you’re interested in renovating, then go to onproperty.com.au/reno, R-E-N-O. That’s my affiliate link for Jane’s course and you can get that free series and that checklist that she talked about. So if you’re going to inspect a property, you can check out that checklist. And then, at the end of the free video series, then we will learn more about The Ultimate Guide to Renovation, which is a great course; which I’m happy to recommend. Thank you so much for coming on, Jane. I wish you the best in this year’s launch of The Ultimate Guide to Renovation. I know it’s going to be really good and a lot of people will go through it. Hopefully we can see a lot of people actually take what we’ve talked about today to actually go and look at their existing portfolio and to see, “Okay, what can I do? What can I focus on? What can I renovate to continue to grow?” and continue to move towards their financial goals. So, thanks so much. I guess I’ll talk to you next time. Jane: My pleasure. Bye, Ryan. Well guys, I hope you enjoyed that interview, I did. Learning about the fact that you can get a free valuation every year and talking about the fact to look at your existing portfolio, try and find one property within your portfolio that can be renovated, that you can get equity growth on and the fact that you could potentially get a small loan of under $20,000 from your current lender and it’s not that big of a deal. Obviously, you need to talk to your mortgage broker about that one. So take that onboard, do your research before you just go in there and start ripping out a kitchen or start painting things. Really begin to understand, “Okay, is this going to make money?” If it will, good luck with your renovation. I hope that it helps you grow the equity in your portfolio. Hopefully it grows the cash flow as well. So you can be in a solid positive cash flow situation. That way, the market goes up or market goes down, you’re still making money every single week. You know me, I absolutely love positive cash flow. Lastly, guys, if you want to gain access to Jane’s free video course or check out The Ultimate Guide to Renovation, which is her premium course that she has. Go to onproperty.com.au/reno, R-E-N-O, to get access to that. You will actually get a free checklist, a printable checklist that you can take with you when you when you go to inspect properties and you can go through and say, “Okay, is this going to be worth doing a renovation? What’s good with this property? What’s wrong with it?” It’s worth going through that link just to get that free resource. Again, it’s onproperty.com.au/reno, and that is my affiliate link. Guys, absolutely appreciate your attention; appreciate everyone’s support of On Property. Until next time, stay positive.